State officials say if there is a prolonged shutdown of federal agencies like the USDA, they may shore up state programs run in conjunction with the federal government. 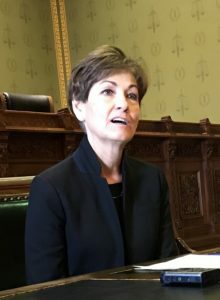 Reynolds told reporters her budget director checks every day with state agencies that may be impacted by a federal government shutdown to ensure “essential services” are provided to Iowans. Legislative leaders say there’s no need for action now, but they’ll re-evaluate if the the federal government shutdown lasts for months. House Speaker Linda Upmeyer, a Republican from Clear Lake, said the election’s over, it’s time to get to work. House Democratic Leader Todd Prichard of Charles City said if the state eventually has to “fill voids” in federal spending, that may create budget headaches. The food stamp program is a joint state-federal program, run through the USDA, which is shuttered. The U-S Ag Secretary has said there’s enough money to provide benefits in February if the shutdown continues. Janet Petersen of Des Moines, the Democratic leader in the Iowa Senate, said if the shutdown lasts longer, state officials need to act. The State of Iowa ended the last budgeting year with a surplus. Estimates indicate there’s a roughly $200 million cushion in the current year’s state budget. That’s in addition to the state’s economic emergency funds.